Caveat: I will use the terms "tank", "cylinder" and "bottle" interchangably throughout this page. This is because all three terms are correct and sites where I researched this page use the different terms. 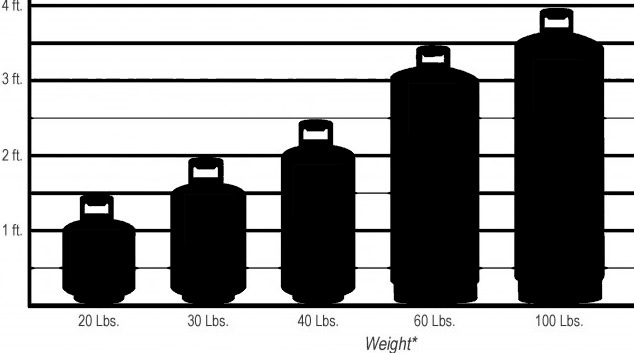 The most common type of LP gas container is the propane cylinder. Cylinders range widely in size and use. Most people are familiar with propane bottles as the source of fuel for their gas grills. Industrial LP Gas consumers are also familiar as forklifts are commonly powered by propane and use cylinders as a portable gas supply source. Cylinders fall into two groups of propane service, liquid and vapor. Cylinders in liquid service are commonly found on forklifts while bottles in vapor service are easily spotted fueling a gas grill. 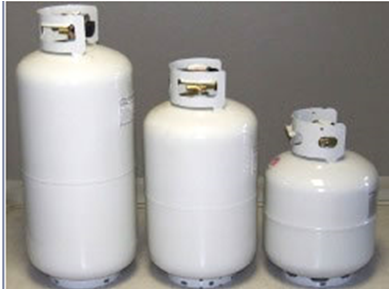 Like large propane tanks, cylinders are subject to rules and regulations set out by Federal and State governments. Propane companies must adhere to these rules when not only filling cylinders, but determining if cylinders are safe and legal to fill. The requirements include protection from rust and damage that may dent the cylinder. Propane bottles, like ASME stationary LP Gas tanks, must be painted a reflective color to avoid overpressure situations. Every cylinder is different. On the collar of the cylinder you will see markings stamped on there. The answer to this question lies in the water capacity of the cylinder. This will be marked as something like WC 239. This is the total mass or volume of liquid, stated in pounds, the cylinder could hold if completely filled with water. All propane cylinders are allowed to be filled with propane to a maximum of 42% of the stamped water capacity. 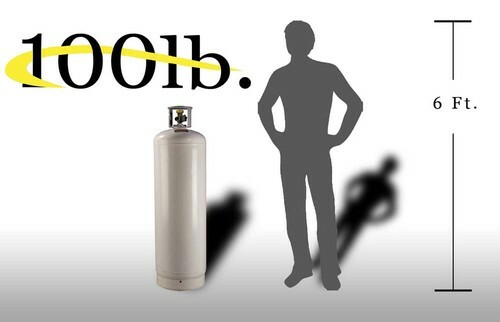 so for our example cylinder we take 239 x .42 = 100.38 lbs of propane. This cylinder can safely hold slightly more than 100 lbs. Some cylinders can't quite hold 100lbs of propane. It depends on the actual volume of space left inside the cylinder when it is manufactured. Cylinders are subject to recertification (also known as requalification) twelve years from their date of manufacture and every five years after that. For example, a cylinder manufactured in January of 2000 will have to be recertified in January of 2012 meaning if you take your bottle to the propane company in April of 2012 to be refilled, it will have to be requalified by authorized personnel before it can be filled. The recertification process is simple and does not take too long to complete. Think of cylinder recertification as an inspection similar to that of your car. A vehicle has to be inspected annually so that it may continue to operate safely on the road. Similarly, a propane cylinder must be inspected so that it may continue to operate safely in LP Gas service. Some time ago I had a 40# tank that needed to be recertified. I searched all over the area for DOT certifed companies to do the job. What I found was that no one really wants to do this as a business. It ended up much cheaper to go to Costco® and buy a new one (first fill was free). A 100# tank will hold 80 gal of liquid but you cannot fill them solid because you need space for the vapor to form. Most 100# tanks have a float valve that will prevent filling above 23.6 gallons. Remember to purchase the tank with the ACME fill multi-valve so it can be filled from a delivery truck. I just switched from a 30# propane tank to a 100# propane tank for my forge. It was empty when delivered and filled at my house with 23 gallons to allow for expansion when the ambient temperature rises (I live iin a desert so the ambient temperature does rise considerably). Remember propane weighs 4.2 Lbs per gallon, or 0.236 gallons per pound, at 60°F so you can this to calculate how much your tank is holding. Since I took algebra in the 7th grade I know you can also calculate the weight of the propane from the gallons pumped into the cylinder if you care to. FOR YOUR OWN SAKE, DO NOT COMPLETELY FILL A TANK! Propane cylinders must be cared for so that their usable life is extended. Cylinders will last longer than their normal life expectancy if they are properly maintained and taken care of. It is recommended that propane cylinders be located in a place that they won't be banged or dented propane cylinder storage) such as an area of high traffic or a location prone to flooding or water puddling. Additionally, cylinders that are handled roughly can damage the foot ring or neck ring which will cause the cylinder to be unsuitable for filling and unusable. See pictures of damaged propane cylinders that are unfit for continued service. Bottle Corrosion and Rust - Because most consumer propane cylinders are made of steel, they are subject to rust. Rust can lead to pitting in the cylinder exterior and render the cylinder useless if the rust or pitting is excessive. If rust is noticed on the cylinder, a wire brush can be used to remove the rust followed by painting over the spot where rust was removed. The most common place rust is found is on the bottom of the cylinder and around the foot ring of the cylinder so it's important to keep theses areas clean and painted. Transporting Cylinders - Propane bottles are usually transported in the back of a truck and more often than not, they are unsecured and free to roll around. Transporting unsupported bottles exposes them to potential damage such as dents and possible harm to the valve. Ensure that cylinders are secured prior to transporting them. In the case of a 20 pound or 30 pound bottle, a milk crate can be used to keep cylinders upright and protected from most damaging effects of transportation.